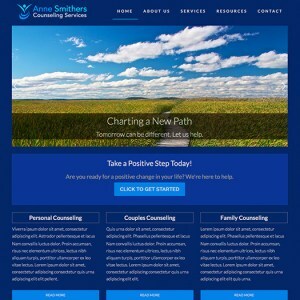 Featuring a soothing, deep blue color scheme, this latest of our Counsella WordPress counseling theme designs is sure to set the right tone with your potential and returning therapist clients. This inspiring theme is built to run on the popular WordPress Genesis framework. This combination guarantees your new counselor's website will be fast, light-weight, SEO-friendly, and easy to manage. If you plan on having an online presence for your therapist office, it makes sense to pay the same attention there that you would to your brick-and-mortar location. This new responsive WordPress counseling theme lets you do exactly that. Inspiring, calming, inviting - these are the emotions evoked by this stunning website.